Recipes to Make Broccoli Cah Meat Sedap .Broccoli is a vegetable that is already in Kelan many people around the world, broccoli is known for having a very nice kandunngan nutrition for the body and for the growth of the child. Broccoli contains vitamin also quite a lot of very important nutrients for the body, as well as a wide benefits bermaca example can be to the health of the eyes, lowers blood pressure, and also the nerves to the body, and still many more benefits of this type of vegetables. Most of this type of vegetables if not liked by the children, and of course the mother if the child confused difficult to stop eating vegetables for example broccoli. Well now you do not have to worry, if your child is difficult to stop eating healthy foods, you could be the creation of broccoli with other ingredients such as meat. For about the recipe and how to make you do not have to bother memilikirkan her, because we are here to share with you about the recipe how to make broccoli cah meat. 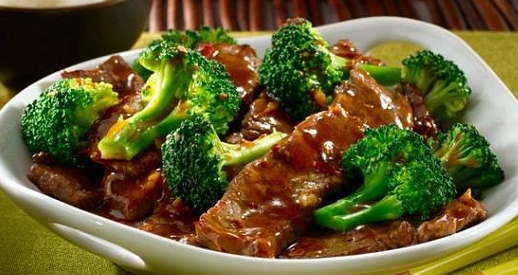 Broccoli cah meat is the food of its kind that looks like stir fry made from broccoli as well as meat, meat used is beef fillet. If you make these dishes certainly you going healthy child, because not only of its vegetables that are high in protein, but of beef is also high enough that good for the growth of your child. Do not be a long time again for the recipe and how to make it, you can just look down here. 150 GRM fresh broccoli, cut in perkuntumnya. 1 sendo vegetable cooking oil. Beef 250 GRM, select the still fresh and then cut into squares. ½ fresh red peppers, in pieces. for the first step, beef that has been diced boiled in boiling water to be cooked, then drain in the lift. Garlic and onions in the pan-fried with cooking oil to be fragrant. Then broccoli and stir meat in the input, then stir until wilted so. On the input paprikannya piece was kept in add salt, pepper powder, flavoring, and sugar. Stir until everything was so well cooked evenly mixed. Tuh bun is pretty easy to make a healthy meal for the little guy, now sekisan course of our top recipes and how to make broccoli cah meat, thank you for your visit on our website and good luck at home. 0 Komentar Untuk "Recipes to Make Broccoli Cah Meat Sedap"